I was so happy to find a red cabbage but this cabbage has been driving me crazy........begged me to buy it, got it home and found out why is was cheap - teasing me with it's very pungent aroma, distracting me from what I should have been doing today. Then finally frustrating me with it's front leaves. 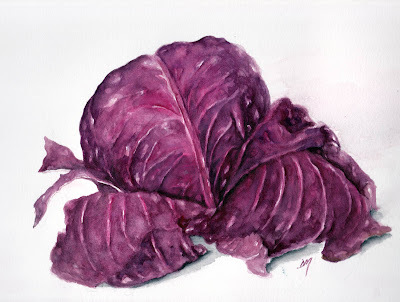 Purple cabbage is so beautiful and you've done a great job with it.